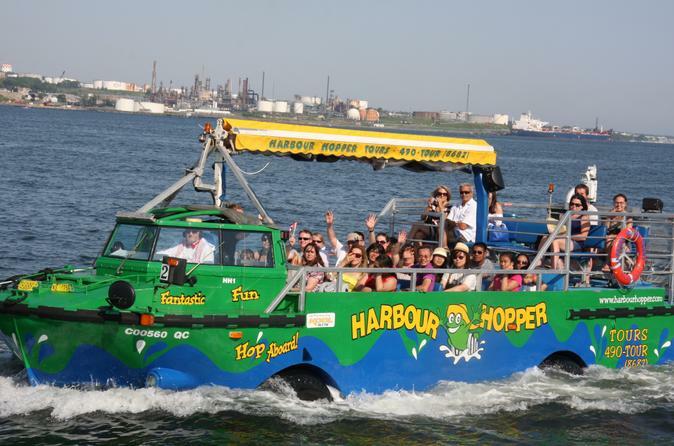 Your 1-hour tour begins at the Halifax Ferry Terminal, where you’ll board the Harbour Hopper, a refitted amphibious Vietnam War vehicle that formerly transported supplies from ships to shore. From your seat on the covered open deck, enjoy excellent vantage points of the city’s top attractions on and off dry land as you listen to your guide’s banter and engaging commentary. During the tour, pick up tips on where to eat, shop and find the best entertainment in town. First, stay on land and weave through Halifax’s historic district downtown. Pass St Paul’s Church, the city’s oldest building dating back to 1749, and the first Anglican cathedral built outside of England. Capture views of Citadel Hill, where Fort George sits on top as a landmark and tribute to Halifax’s key naval role during the British Empire. Drive by Halifax Public Gardens, a stunning example of a Victorian-era garden. Admire linden and elm trees and catch glimpses of wrought-iron gates, a bandstand, fountains and statues, as well as exotic and semitropical flowers. Then hold on as you plunge into the waters of Halifax Harbour for views of the waterfront and navy ships and submarines. Learn about the 1917 Halifax Explosion, the city’s naval fleet, and Halifax’s role during times of war and peace. Return to the departure point, ready to hit the town for further exploration on your own.